Crossword apps don’t get any better than this. Developed by Rumination Software, CRUX Crosswords is an essential download for the crossword fan. With puzzles from a number of US, UK and Australian sources including the New York Times, People Magazine, Washington Post, Globe and Mail, Sydney Morning Herald and Telegraph – you’ll never be short of new crosswords to try. Several of the sources require a paid membership in order to access the puzzles, but most are available as a free download. There are also 15 all-new CRUX starter crosswords included with the app to help get you going. 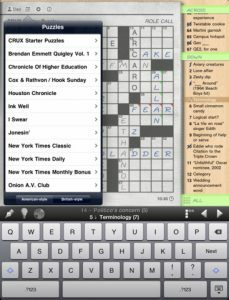 With a simple, polished interface that makes playing your crosswords more fun and less work, Crux Crosswords will replace your pen and paper in no time. 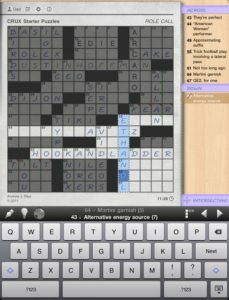 The app supports a number of unique views which help you focus your thoughts in the way that works best for you, for example select “incomplete” just to see what is left in the current puzzle, or “intersecting” to highlight a random mini-puzzle within the current crossword. 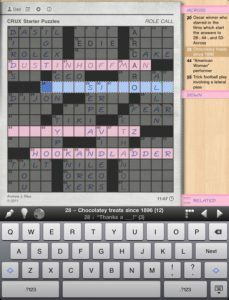 It’s easy to flick between Across and Down sections, and you have the ability to either tap on the question description in the right-hand info bar, or the question number on the crossword itself in order to enter your answer. 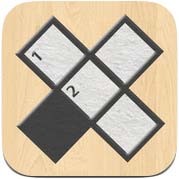 There is also an on-screen ‘D-pad’ which helps you navigate square-by-square if you’re finding it hard to be precise. During each game, the keyboard sits at the bottom of the screen so you can type in your answer as it comes to you. After you’ve typed it in, that question gets marked off in the list so you know at a glance what you need to finish – but don’t worry, it doesn’t tell you whether your answer is right or wrong until the end. If you’re struggling with a particular question you can get a hint with the ‘reveal’ option, giving you the choice of revealing just one cell, all incorrect cells or the whole puzzle. New features are being added all the time, with the developers planning on integrating iCloud, landscape mode, the ability to delete/hide sources and individual puzzles, clue/answer lookup on the internet, and social media integration in the near future. 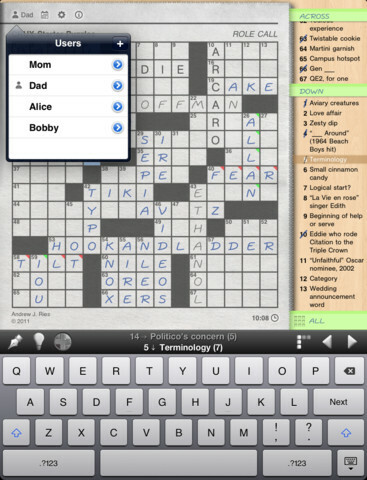 Bottom Line: CRUX Crosswords for iPhone and iPad makes finding and solving crosswords easy and fun. A must-have for the crossword fan. 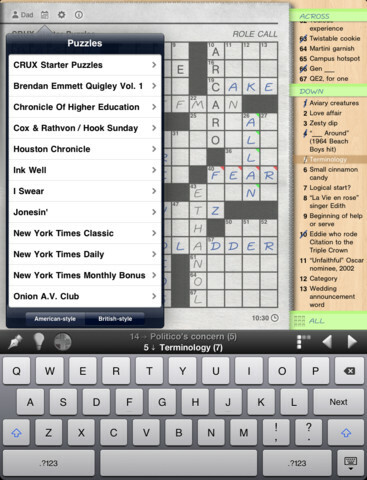 Crux Crosswords is compatible with iPhone, iPod touch, and iPad. Requires iOS 3.2 or later.